Behind one of the Worst (zombie) covers of all time hides a lot of musicianship. The cover boasts members of GUNS`N`ROSES, ex TESTAMENT and ex MEGADETH which is a good hint. Paul Waggoner of BETWEEN THE BURIED AND ME opens the proceedings and does ok. The band name means nothing to me but Paul varies his melody. Kris Norris follows suit with his heavy, modern and melodic style. He is actually inventive as a bridge between the old heroes and the styles of the later generations. David martone is my new guitar hero, note the technique and the amount of inventiveness. Then it´s time for Bumblefoot of GUNS`N`ROSES to get ""Disengaged". The title lies cause he is very engaged. It is so melodic and engaging, which is somehow more than I expected. DÅÅTH guitarists Eyal Levi and Emil Werstler also contributes melody and capture my interest more than their main band. Shane Gibson wis the most amusing title contest with his "Artichoke Samurai". he is also more interesting than his main band (KORN) but fails to reach the levels of most other contributors. Next up is Devin Townsend (STRAPPING YOUNG LAD) who is always over the top, enough said. Old MEGADETH hero Chris Poland, who is in OHM these days, is next. Everybody knows he can play but he relies to much on heaviness. This kind of track is not so entertaining without vocals. I have never been one to applause SOILWORK or DARKANe but their guitarists Ola Frenning and Christoffer Malmström are great here. They offer classic melodic guitar driven metal, and they sure are in the drivers seat. A great positive surprise this the fastest track on the disc. Mike Orlando is not someone I have ever heard but he brings a smile to my face with his melody and technique in this power metal-inspired track. My old idol James Murphy always delivers and "Maiden Voyage" is no exception. Everything James touches turns into dazzling technique. Apart from the others on the track James adds more of the 80´s than all of the others together. David Martone is the pick of the bunch, as always, and will turn into a magnitude the way e.g. JOE SATRIANI did in the 80´s. As a whole the album is a positive surprise in many ways. 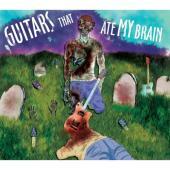 Both old and new guitar freaks will enjoy this, given that they can overlook the cover!